TL;DR: In this article, you will learn how to take advantage of Angular Material to create beautiful and modern Angular applications. 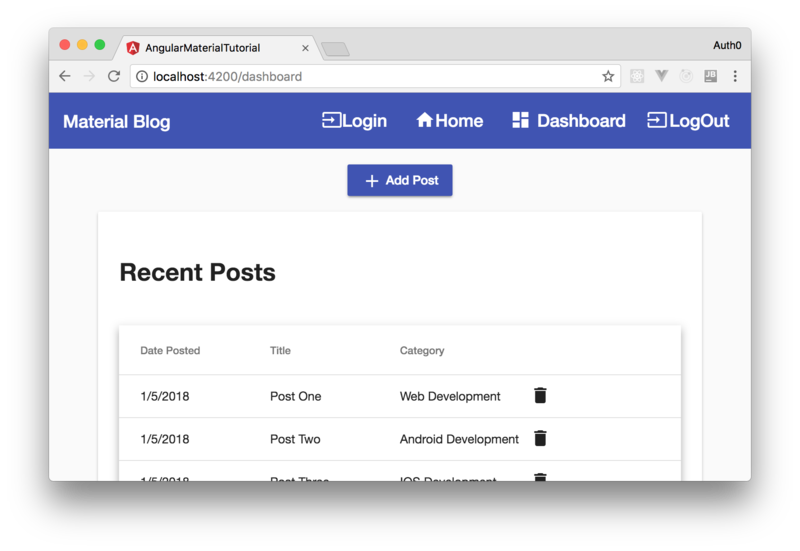 You will start from scratch, installing Node.js and Angular CLI (in case you don't have them yet), then you will install and configure the dependencies needed to develop with Angular Material. You can find the final code developed throughout this article in this GitHub repository. 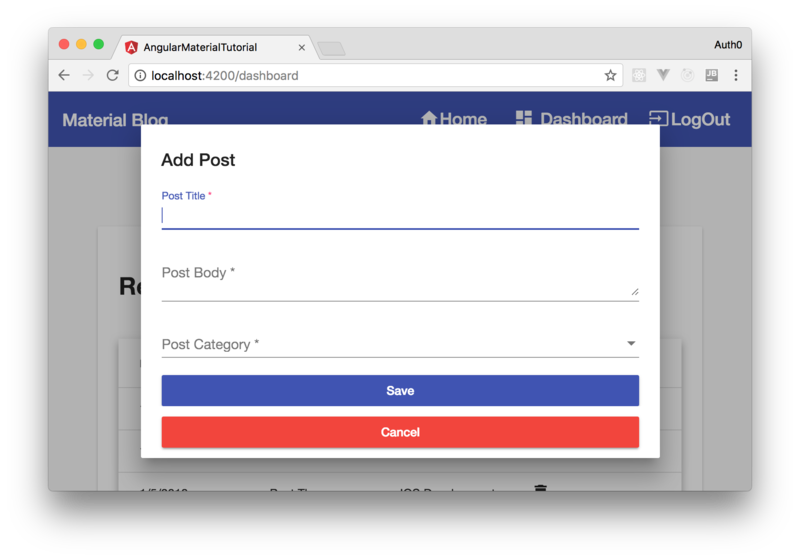 Angular Material is a third-party package used on Angular projects to facilitate the development process through reutilization of common components like Cards, beautiful Inputs, Data Tables, and so on. The list of available components is big and continues to grow as we speak. So, for a full reference of components with examples, check the official website. With Angular, the entire app is a composition of components and, instead of building and styling components from the group up, you can leverage with Angular Material which provides out-of-the-box styled components that follow the Material Design Spec. This specification is used by Google in the Android operating system and is also very popular on the web due to its beautiful UI utilities. The idea of this is article is to teach you how to use Angular Material through a hands-on exercise. First, you will check the dependencies that you need on your computer to use and develop with Angular Material, then you will learn how to configure and use different components. To work with Angular, you will need Node.js and Angular CLI (Command Line Interface) installed in your development environment. Node.js will provide the packages needed by the CLI to work and the development server so you can check your progress in real time. Angular CLI is the tool that helps you create a new Angular project and configure Angular components, services, and so on. You will need it because an Angular project is more than just HTML and script files. That is, An angular project uses TypeScript which needs to be transpiled and optimized to run browsers. Without Angular CLI, you would need to setup and wire a lot of tools to work together, which would consume too much time. Note: Depending on the setup of your computer, you might need to use sudo to use the -g (global) flag. The first command will generate a directory/file (under a new directory called angular-material-tutorial) structure with a bunch of files that are needed so you can create your Angular applications. To learn the details of this structure, please, check the Angular CLI documentation. The second command will move your terminal into the project root directory. For now, you won't make any changes to your project's source code. First, you will install a few more cool dependencies. By the way, if you don't know what IDE (Integrated Development Environment) to use while developing with Angular, Visual Studio Code is a great (and free) alternative. Some components like Slide Toggle, Slider, and Tooltip rely on a library called HammerJS to capture touch gestures. So, you will need to install HammerJS and load it into our application. After setting up the Angular project structure and some dependencies, you will be able to start developing apps. 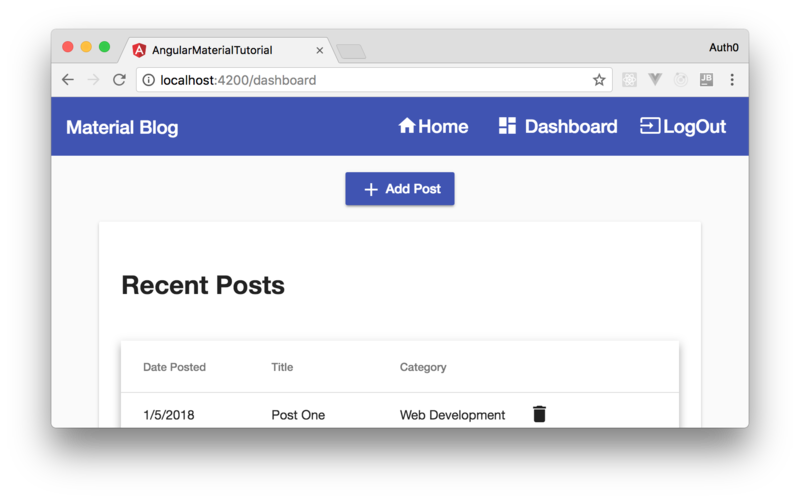 In this article, to learn Angular Material through practical exercises, you will develop a dashboard for a blog engine where users will be able to insert new posts and delete existing ones. This won't be a full-fledged application with a backend persistence nor enhanced features. The idea here is to show how cool and easy it is to use Angular Material. "I'm learning Angular Material through practical exercises!" Note: You are also adding BrowserAnimationsModule so your app can count on some cool animation features (like the shadow on the click of the buttons). For now, you won't have anything nice to see in a browser yet, but you will get there soon. To make your life easier when defining the layout of your Angular application, you will take advantage of the Flex layout schema introduced recently on CSS. More specifically, you will use an Angular directive called fxFlex to handle the Flex layout. Note: You are explicitly installing v5.0.0-beta.14 of the @angular/flex-layout library because the newer version available is not working properly with Angular 6. Note that after the major upgrade to Angular 6, you will need to install rxjs-compat alongside with @angular/flex-layout. The command above already include this library. So, it is just a matter of copying and pasting the command in your terminal (while being in the project root, of course). If you take a close look, you will see that you are already using some features of this package in the navigation bar defined before. For example, you have added directives like fxLayout, fxLayoutAlign, and other fxFlex directives. With these rules in place, you can issue ng serve from your project root to check your application for the first time. It's important to define --module app.module because you have another module called material.module which makes Angular CLI unable to identify the targeted module automatically. This is a platform for technical writers to manage their blog post contents related to angular. <br> Click on Login to get Started!!! Don't worry about the DashboardComponent for now, you will work on it soon. In this file, you are defining two routes: one for the WelcomeComponent and one for the DashboardComponent. As such, when you head to http://localhost:4200 you will see the WelcomeComponent and when you head to http://localhost:4200/dashboard, you will see the DashboardComponent. If you check your application now (through ng serve), you will be able to see the contents defined in the HTML file of WelcomeComponent. Also, if you click on the Dashboard link, you will see that it loads the "dashboard works!" message. As your dashboard component has nothing more than a simple message, it's time to focus on enhancing it. The idea of this dashboard is to let users add and remove blog posts. As such, the first thing you will do it to define an interface to represent instances of blog posts. In your data service, you have two different arrays: one for storing categories of posts and the other one for storing blog posts. As you don't want unauthenticated users to create blog posts nor you want them to remove existing ones, you will take advantage of Auth0 to easily secure your app. So, before integrating Auth0 into your app, you will need to sign up for a free Auth0 account. After following the instructions there to create your account, you will need to create an Auth0 Application to represent your Angular app. Once finished, Auth0 will show you a screen where you can see tabs like Quick Start, Settings, and Addons. Choose the Settings tab and add http://localhost:4200/ as a Allowed Callback URL. This is the URL that Auth0 is allowed to call after finishing the authentication process (this configuration exists to make the process more secure). // why do you need defining window as any? The code in this service, although lengthy, is quite simple. You are just defining an instance of auth0.WebAuth to interact with Auth0 and then you are defining a method called handleAuthentication that will fetch the tokens returned back by Auth0. Also, there are other handy methods in this service like isAuthenticated, login, and logout. You will use all of them soon. Important! You will need to replace <APPLICATION_CLIENT_ID> and <YOUR_AUTH0_DOMAIN> in the code with the values from your Auth0 application. For example, the client id will look like lU4PgkBaogkZP13Mv1gSkHK6VIH6xIkq and the domain will look like bk-tmp.auth0.com. In the new version of this file, you are using the methods defined in the service created before to show or hide the login and logout buttons. Running your application now, you will be able to log in through Auth0. After logging in, you will see that you are redirected to the dashboard and that the Logout button is shown. This will be enough to tell unauthenticated users to log in. That's it! You have just created your first app with Angular Material. Easy right?! "Angular Material makes it easy to develop modern apps with great UI!" In this article, you had the chance to use Angular Material components to create a beautiful application without investing too much time thinking about styles. What is great is that besides being easy to use, Angular Material components leverage best practices and a common UI that most users out there are already used to. Awesome, right?